“Meet the Patels” poster. Photo Credit: © Four in a Billion Pictures. What started out nearly 10 years ago as a family trip to India, has now become one of the most endearing documentaries yet to be made about the search for love. Private and soul baring, comedic and tragic, alienating and familiar, Meet the Patels is a new film by the Indian-American brother and sister duo, Geeta V. Patel and Ravi V. Patel. And it’s already beloved by audiences in North America, having won the Audience Award for Best Documentary Feature at the Los Angeles Film Festival last month and second place for Top Ten Audience Favorites at the 2014 Hot Docs Film Festival in Toronto. And what a story it is. As Ravi stumbles into his 30th birthday, his parents — Indian immigrants — begin tolling the nuptial bells. And like many Indian-American parents, they have specific notions for Ravi’s bride. His mother, Champa, is a renowned matchmaker and the family beacon of traditional Indian values. She and her husband, Vasant, have been married for 35 years through an arranged marriage system so entrenched in Indian society that there is a catalog published of all available young men and women with the surname of Patel (people living in or originating from the same 50-mile square radius in India). The phone book-sized tome contains pertinent information such as age, skin tone, education, and profession. From these “Biodating” résumés, to online dating services, to conventions, to speed dating, Ravi travels the Indian-American marriage road like Goldilocks discovering the three bears’ cottage, yet unable to find his “just right” fiancé. Frustrated by his son’s finicky taste, Vasant declares, “Not getting married and staying single is the biggest loser you can be!” As pressure mounts, Ravi and Geeta are forced to reevaluate their dual cultures within their second generation’s notions of love and family. Geeta, a few years older than her brother, is his sounding board, his confidante, and his cheerleader, for she’s already gone down this road and came up empty-handed. Halfway through the film, Geeta asks: “What’s love?” Ravi freezes, like a doe in the headlights, thinking of the white girlfriend he’s recently left after a two-year relationship, unbeknownst to his parents. “I don’t know what love is,” he replies. “I know I care a lot about her. She makes me a better person in so many ways.” And thus, the push-me, pull-you stage has been set. The day before the film’s L.A. premiere, I spend some time with Geeta and Ravi. They’ve just returned from a retreat, and while many in their shoes might be exhausted (their parents had also just flown in from their hometown of Charlotte, North Carolina), their energy levels vary from exuberant to electric, bouncing off each other like pinballs. Admittedly, within the first three minutes of our interview, I am wishing that I were sitting across from them in some posh L.A. hotel sipping iced mint tea. Instead we are on a three-way call, each in our respective homes, and yet, I can picture them across from me: Ravi wearing a short-sleeve button down shirt, running his fingers through his thick, jet-black hair and offering a toothy smile as long as the Ganges; and Geeta brushing her onyx curls away from her high cheekbones and sculpted shoulders as her dusky, almond eyes exude enthusiasm. Hungry, Ravi begins eating a meal at his home (politely muting himself when chewing), while Geeta and I break the ice by discussing our previous experiences living in Germany — she in the new capital of Berlin (as a study abroad student); I in the former capital of Bonn (as a graduate research fellow). She extended her stay for an additional year and worked at the State Department with hopes of someday becoming a diplomat. But ultimately film was her passion, and she turned her diplomatic skills into documenting human stories at cross-cultural divides (she intimates an interest in returning to Germany and making a film someday). Geeta’s first feature documentary, Project Kashmir (2008) — co-written/directed/produced with her friend, Senain Kheshgi — explores the religious strife between Hindus and Muslims that has held Kashmir in a state of perpetual conflict for over five decades. Risking their lives, Geeta and Senain enter a beautiful land whose people are at once grief-stricken and hungry for joy in a quest to understand not only Kashmiris’ perspectives but also their own Indian and Pakistani perceptions, respectively. The documentary, supported with three Sundance fellowships and a Tribeca TAA fellowship, premiered at IDFA and on PBS’s Independent Lens (2010). Ravi’s choice of the word “this” doesn’t do justice to the wide-arching magnitude of the new film, for although it focuses specifically on the cultural and religious identity of the Patels — in India and America — it’s not difficult to be from another culture, religion or race to understand the pressures the brother and sister feel being caught between two identities while in pursuit of individual happiness. 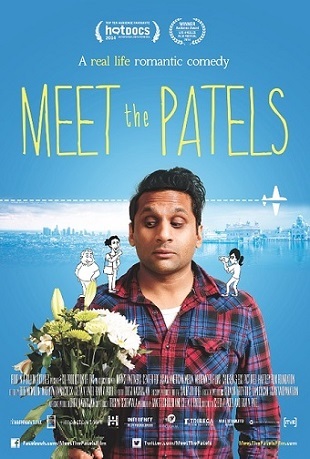 Meet the Patels poignantly showcases the struggles many families experience when divergent views erupt (screaming, crying, quarrels, closet skeletons), and yet it is peppered with such comedic force that it can speak to filmgoers across the globe. It helps, of course, that the star of Meet the Patels is a professional stand-up comedian and actor (Ravi has appeared in Scrubs, It’s Always Sunny in Philadelphia, and Transformers, among others).